South Shields' players celebrate their opening goal in the 7-0 victory over Jarrow Roofing in Northern League Division One last Saturday. Image by Peter Talbot. All roads lead to Southampton for those of a South Shields persuasion tomorrow as the Mariners bid for a place in the FA Vase quarter-finals. Shields are taking on university outfit Team Solent in the fifth round. Graham Fenton and Lee Picton's side have won their last 13 games in all competitions. Image by Peter Talbot. Despite the round trip of about 660 miles, the Mariners will be backed by hundreds of travelling supporters on the south coast. It is arguably the club’s biggest game for some time, with Shields bidding for a place in the last eight for only the second occasion. Despite having never gone past that stage, Shields go into tomorrow’s tie as favourites for not only the match, but the competition as a whole. The ‘favourites’ tag is one the club has grown accustomed to over the last two seasons, though, and joint manager Graham Fenton is confident it will not weigh his side down. He told TheFA.com: “We seem to be dealing OK with the pressure, but I don’t look at the odds. “The boys and everyone at the club have got to deal with that sort of pressure anyway. “Huge things are expected from the football club and the players are dealing with it really well at the moment. “By the time you get to this stage, everyone left in the competition will be dreaming of a trip to Wembley as there are only 16 clubs left. Shields are travelling to Southampton by plane this afternoon, with this set to be the longest journey of the club’s modern history. While it is true the draw could have been kinder, and the Mariners would have preferred a tie closer to home, they are hoping to use it to their benefit this weekend. 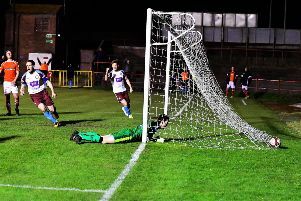 Fenton told NonLeagueDaily.com: “At this stage in the competition you would love a home draw, especially with the amount of fans we get at Mariners Park, but, in terms of a weekend away with the lads, it is going to be great for us. “Since we have been here we have been fully focused on getting results, and we haven’t had a lot of social occasions together. On the preparations for the tie, Fenton added: “Obviously it is difficult to see Team Solent in person. “I was going to take a drive down there last week, but the weather was against me and it looked like it would be a waste of time. “But we have done our homework on them. We have had them watched and we have had a really good report done on them and we are well prepared for the game. Kick-off is at 3pm, and Shields will welcome back Julio Arca from suspension. However, they’re without the cup-tied Anthony Callaghan, banned Iulian Petrache and injured Leepaul Scroggins.